There comes a time in every online organizer and fundraiser’s life when they ask themselves: is this normal? Our response: what does the data say? 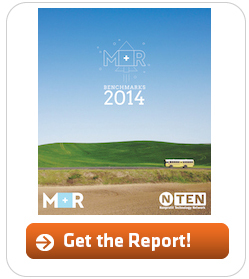 Published today, M+R and NTEN’s 2014 Nonprofit Benchmarks Study returns for the eighth year. We’ve crunched the numbers from 53 nonprofit organizations to define this year’s industry standards for online fundraising, advocacy, and list building. What did the findings reveal? 2013 really raised the bar for online fundraising. Nonprofits received an estimated 1.7 cents for every fundraising message delivered, and 60 cents for every website visit. Even though response rates for nonprofit emails continued to slide in 2013, online giving was up as email and social media audiences and web traffic kept climbing. The average one-time online donation amount to a nonprofit was $68 in 2013. Nonprofits received $0.60 per website visitor. Key email metrics, including open rates and response rates, declined in 2013. Email open rates were down 4%. Response rates were down in 2013 for both fundraising emails (down 11%) and advocacy emails (down 25%) compared to 2012 levels. Interestingly, the response rates to advocacy emails from Environmental nonprofits were more than two times higher than overall response rates for advocacy emails. Nonprofit social media audiences grew faster than nonprofit email or website audiences. Facebook fans were up 37% and Twitter followers were up 46% in 2013. Despite this rapid growth, for every 1,000 email subscribers nonprofits had just 199 Facebook fans and 110 Twitter followers. Also, check out the infographic that we released yesterday in Mashable! If you’re interested in learning more about this report, and how to establish benchmarks in your own organization, register for our free webinar next Wednesday, April 16 at 12:00pm-1:00pm PT.